PHUKET: Phuket friends Sarah Dean and Lindsay Cameron spent two weeks travelling Vietnam from north to south. One of the highlights was a food tour in Ho Chi Minh City, where the pair sampled everything from goat, frog and banana wine, but drew the line at the boiled duck foetus. 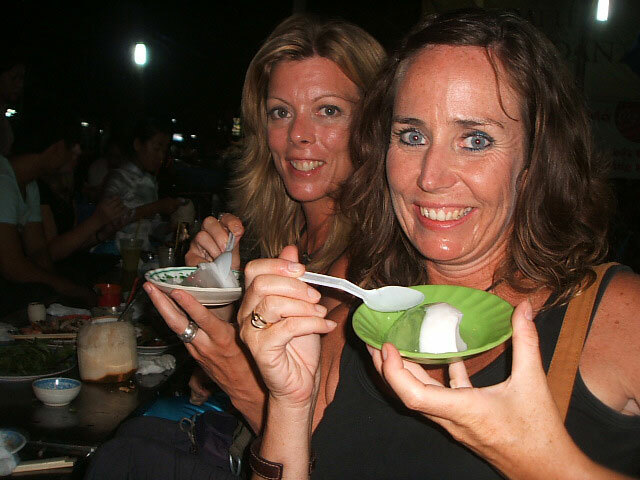 Lindsay Cameron, left, and Sarah Dean enjoy Vietnamese food treats. Most guidebooks advise taking anything from three weeks to three months to do this trip, but we like a challenge and don’t like to stay put for too long. We had covered 1,700 kilometres and seen the most beautiful scenery, ranging from bustling cities to remote jungle waterfalls. We’d been on motorbikes, bicycles, buses, rowing boats and loved every minute of it. Neither of us dared to even talk about the fact that our trip was coming to an end with only 24 hours in Ho Chi Minh City. We had thought we would just wind down with a little eating and shopping. However, a couple of days prior to us arriving in Ho Chi Minh City, a good friend in Phuket had emailed us with details of a tour that she thought might be of interest. A four and a half hour evening food tour on the back of a scooter around the southern Vietnamese city, eating and drinking local style. Does it get any better? We booked the tour within minutes of reading the email. We got picked up by our lovely guides for the foodie tour on the dot at 5.30pm. They were immaculately dressed in traditional Vietnamese costumes, introduced themselves with big smiles as Ang and Boom (something like that anyway) and off we went to our first stop. At 5.30pm in Ho Chi Minh City, like most countries, it’s peak traffic time. here’s something insanely crazy and exciting about riding around a hugely populated city experiencing hundreds of other bikes whizzing past and around you from all directions. Particularly when your guide insists on asking questions such as ‘Do you have any pets?’, or ‘Do you like to go to the cinema?’. Eh no, I’d rather you kept your eyes on the road thanks! Our first stop was for beef noodle soup at a local restaurant down a back alley. With not a tourist in sight apart from the five other people on our tour, we sat on the usual tiny plastic chairs that force you to sit with your knees almost on your chest and get indigestion, and listened while our guide explained what was in the soup. Thankfully it was not the tame ‘pho’ that we had eaten up until now, but rather ‘bun bo’ from the central city of Hue, a much tastier and spicier version. Although, when we were presented with green tea to drink with the soup, neither of us had to speak. The look we gave each other said it all – where was the beer? However, we drank the tea graciously and off we went to our next stop. Our next food stop was at an outdoor barbecue restaurant where we were to cook and feast on goat, frog and barbecue prawns and sip shots of locally brewed banana wine (and beer by this stage). We were told the goat was goat breast. We relaxed. On looking at it on the barbecue, it didn’t look like the ‘breast’ we are used to, say on chicken. We soon learned that it was in fact the breast, as in the teat, which probably explains the chewiness. Our drivers and guides were obviously instructed to ‘look after’ us the entire night. We didn’t have to lift a finger. They peeled our prawns for us, shelled our crab, kept us topped with beer and, slightly over the top, even held our hands when accompanying us to the toilet. Our last stop was mainly seafood. Crab in chilli and garlic, crispy quail and the most amazing grilled scallops with nuts and spring onions, followed by a dessert of coconut pudding and a Vietnamese style crème caramel. We tasted it all to a point where our stomachs were full to bursting. We did, however, draw the line at tasting what can only be described as a boiled duck foetus still in the shell. The feathers did not look appetising. We took the obligatory photos and tried to be polite while hiding our disgust. Only one of our party was brave enough to try it and it wasn’t either of us! The trip took us around five different districts in all so it was a great way to experience the diversity of Ho Chi Minh City: affluent areas, poor areas, shopping areas, market areas – all fascinating in their own way and a great way to see the city if you are short on time. We had seen parts of Ho Chi Minh that we would never have gone to, experienced driving (and surviving) in one of the busiest cities in the world, tried some new food, and got to mix with the locals. It was a fantastic way to end an amazing trip through Vietnam.